First of all, Chris may be the only (hungry) person I know who can conceive of an ingredient one might normally put in muffins that he would be unwilling to eat. I mean, unless the muffins are filled with pickles they’re likely to at least be edible. 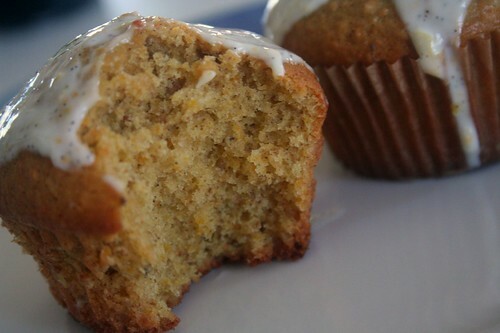 But second of all — and more importantly — the muffins in question were, in fact, made from squash. “I think squash is your new zucchini,” Chris decided, at which point he was treated not just to a muffin but also to a fairly lengthy and very interesting oration on the differences between summer squash and winter squash. He’s right though: we have been eating a lot of squash. The winter kind, because it’s winter. And by winter I mean that until today, when it reached a balmy 36°F, there was about two and a half feet of snow on the ground. Regardless of what the calendar says about the upcoming solstice, it already feels pretty damn wintry. Locally grown produce consists of squash, potatoes and — through some sort of lovely greenhouse magic — leafy greens. While I adore leafy greens in the abstract, I rarely know what to do with them once I’ve gotten them home, so I’ve been stocking up on squash. It’s wonderfully versatile, keeps well and, as it turns out, makes an awful yummy muffin. Yummy comes in quite handy if you (for example) attempt to make mini muffins without the help of a mini muffin tin, but yummy is only half the story. Because in addition to being yummy, these muffins are easy peasy — you know, if you want to get all adorable and British about it. For starters, Jamie assures us that there’s no need to peel the squash, and having eaten, um, several of these muffins I can confirm his advice. Secondly, the muffin-making process consists of little more than dumping things into your food processor and pressing the pulse button. Then while the muffins bake you whip up a delightfully tangy little frosting using sour cream, confectioner’s sugar, clementines, and vanilla. The tanginess of the frosting and the sweetness of the squash combine to create a perfectly delicious little (misshapen) muffin. 1) Preheat the oven to 350°F. Grease your muffin tins or line them with paper cups. 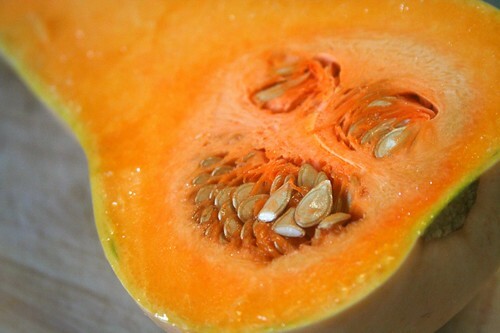 2) Slice the squash in half vertically and scoop out the seeds and stringy flesh. Chop the squash roughly or shred it using the food processor. 3) Whiz (Jamie’s word) the squash in your food processor until finely chopped. Add the sugar, then crack in the eggs. Add a pinch of salt, the flour, baking powder, nuts, cinnamon and olive oil, and whiz together just until combined. 4) Fill the muffin cups with the batter. It’s fine to fill them almost all the way to the top. 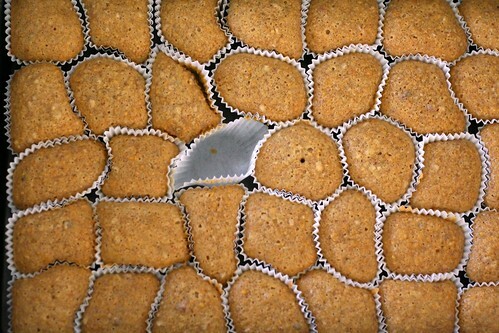 Bake for 20-25 minutes, or until a toothpick inserted into the center muffin comes out clean. Remove from the oven and cool on a wire rack. 5) As the muffins bake, make the frosting. Place the clementine zest and lemon zest & juice in a medium bowl. Add the sour cream and confectioner’s sugar and mix well. Slice the vanilla bean in half lengthwise and spread each half open. Scrape the seeds into the frosting using the dull side of a paring knife. Stir until combined. 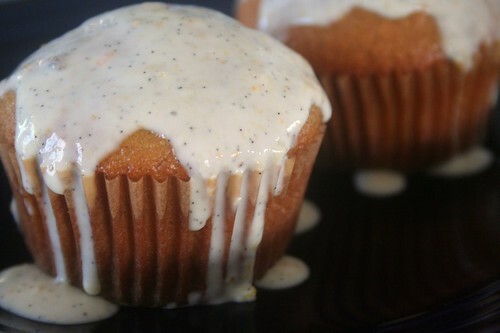 Place frosting in refrigerator until the muffins have cooled. 6) Spoon frosting over muffins and serve. These muffins are delicious when freshly baked but nothing to write home about the next day, so don’t overdo it. This entry was posted on December 15, 2008 by Megan @ When Harry Met Salad. It was filed under baked goods and was tagged with butternut squash, muffins, squash. As a bonus, on the day they are baked these muffins are one of the few solid foods that can be rearranged into a nice heap of mushiness for those who have gone temporarily toothless! In LA, you can buy frozen pizza with squash on it, which is like some strange hybrid cross between your culinary world and Chris’s. Wait…. You don’t peel the squash? You just process the thing pretty much whole (if you don’t count strings and seeds)? I keep re-reading the bit about the peel and I’m still digesting this (excuse the pun). Seriously, the skin stays on? If so, that’s genius. My neighbor always gives me cartloads of butternut squash, and it would be great to have a recipe which doesn’t even require me to peel the darn things. Seriously, you don’t have the peel the squash or otherwise remove its skin. I know it seems crazy, but if I hadn’t made the muffins myself I would have had no idea they involved skin. Oh my, I love that picture of the misshapen muffins! They’re wonderful! I’m making these tonight, so I will post about them soon. I LOVE this, But I am Gluten/Wheat/Dairy intolerant. So I made this gluten/dairy free, If anyone wants the modified recipe, let me know! Otherwise GREAT muffins. Try with sweet potato!